Advanced features include 3D graphics, structure maps, map gridding, draingae areas, complex map calculations, importing and exporting. See the Product Information for a more complete listing of program features. 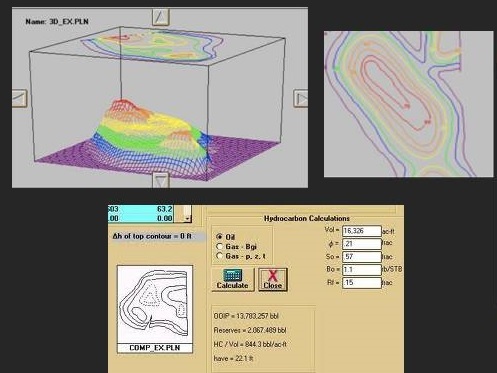 Use a digitizing tablet or on screen tracing and our Plan Plus software to quickly and accurately digitize isopach contours, calculate contour areas, map volumes, and oil & gas in place. Digitize well locations, faults, partial contours and sink holes. Digitize leases and compute lease volumes. Vastly improved on-screen digitizing with automatic contour tracing, more image file formats supported, touchscreen support with stylus or finger, manual on-screen contouring with editing, and define bottomhole locations and well paths. Already have a digitizing tablet or only need to digitize on screen? 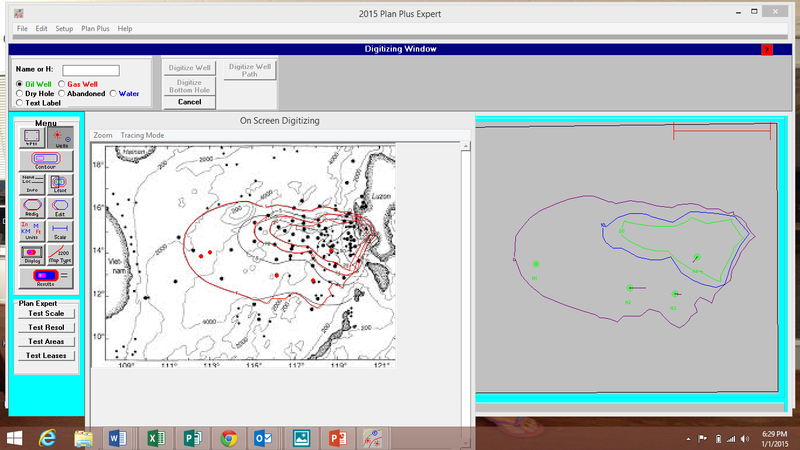 2015 Plan Expert is a Windows-based program that allows users to planimeter contour maps. 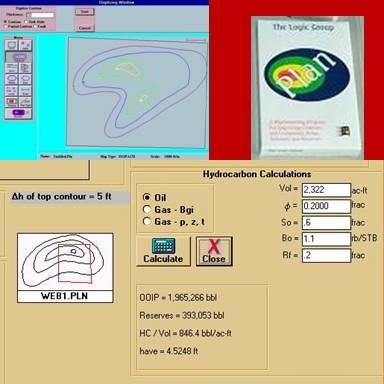 Within the program, maps are entered using a digitizing tablet and contour areas, map volumes, and oil and gas in place are computed. Digitize portions of a map such as a lease and compute their volumes. Digitize faults, well locations, sink holes, multiple hills. A complete planimeter program for the oil industry. 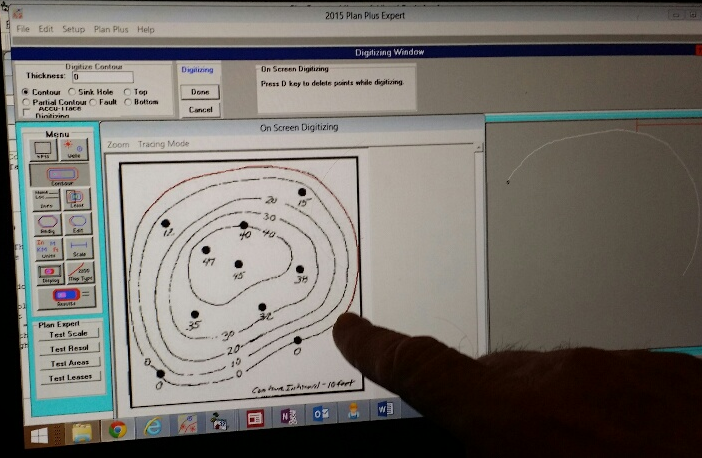 2015 Plan Expert can be used with a digitizing tablet to input the contour maps, OR digital maps can be traced on screen using the computer mouse or pen stylus. 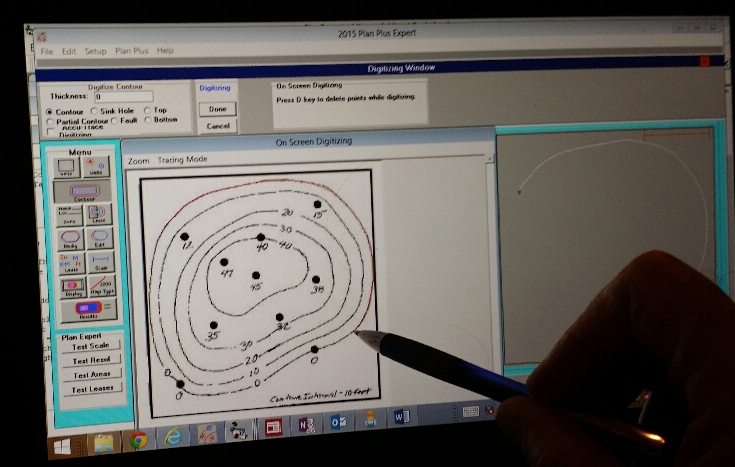 2015 Plan Plus Expert adds several advanced features which enhance the analysis of contour maps. Features available in Plan Plus include: importing or exporting lat/long or utm files, viewing contour maps in three-dimensions, computing drainage radii, analyzing volumes from structure maps, discretizing values from contours, more advanced methods for analyzing complex maps of multiple hills and valleys, create dxf graphics files, and printing or plotting maps in various scales. Plan is a Windows-based program that allows users to planimeter contour maps. Within the program, maps are entered from a digitizing tablet and contour areas and map volumes are computed. Plan includes an easy interface that guides the user through the program. Plan can analyze isopach, pore volume, hydrocarbon pore volume, and structure maps. For structure maps to be analyzed in Plan, the contours must have closure. For structure maps, contour areas are computed, but volumes are not. Scales can be in English or metric units. Faults, sink holes, and well locations can all be included on the map. partial contours can be defined to simplify digitizing. While digitizing, Plan graphs contours, faults, sink holes, and well locations. Plan can be used with a variety of digitizing tablets connected to the computer through a serial port. Once a map is digitized and saved, it can later be reloaded and contours edited. a redigitizing feature is available for quality control. The user may digitize a contour several times and then select a specific "try" or an average of all tries. Once a map has been defined, Plan presents two tables. One table gives the areas of each contour value and the second gives the volumes by the user-selected volume methods. Volume methods included in Plan are: Trapezoid, Pyramid, Combination, Quadratic, Step, Ratio, Simpson's, and 3/8 Rule. Users specify the top layer, delta h, to define peaks for the volume calculation. Reserves can be calculated in Plan from user defined parameters for volume, porosity, hydrocarbon saturation, formation volume factor, and recovery factor. Users can select which volume methods to display. A report summarizing the results can be printed. This report includes the map, area and volume tables, reserve calculation if done, and information about the analysis provided by the user. Plan adds map files to compute areas and volumes for over-sized maps digitized in parts. The program also allows portions of a map to be defined to obtain area, volumes, and reserves for leases. Leases are defined by digitizing lease boundaries. Results from several leases can be combined to obtain totals for different owners of a field. Plan has a tutor key which provides on-screen instructions. Documentation with "hot spots" and figures is provided on-screen. Plan provides users with an efficient and accurate tool to planimeter maps and estimate map volume and reserves. Written in the elegant style of Windows the program's straight forward approach makes Plan easy to learn. Whether you occasionally planimeter maps or analyze hundreds every month, Plan will provide you a valuble tool. ENTER CONTOUR – Plan 2015 allows users to quickly enter contours by tracing the contours of maps placed on a digitizing tablet. Partial contours which share previously digitized contour boundaries or faults lines can easily be defined. 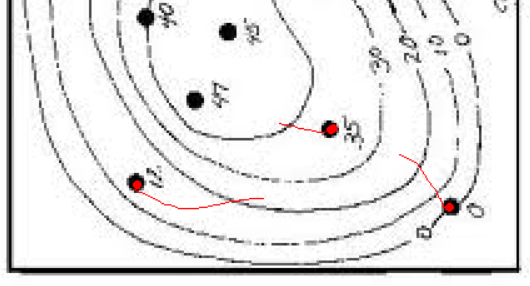 Contours are displayed with labels in corresponding color or in black. COMPUTE RESULTS – Plan 2015 computes areas, map volumes, and reserves. A table and graph present the area for each label thickness. Another table compares volume computed by up to eight different methods. Oil or gas reserves can be calculated from user defined parameters. DEFINE LEASES – Plan 2015 allows a portion of a map to be easily defined and the corresponding areas, volumes, and reserves computed. Leases are defined by digitizing lease boundaries. The results for one or any combination of leases can be computed. ENTER WELL LOCATIONS – Users can digitize well locations and Plan 2015 displays the location on the map with the well name and well symbol (oil, gas, water, dry hole, or abandoned). EDIT CONTOURS – Plan 2015 allows users to edit contour maps. Users select what to edit by clicking on the contour, fault, sink hole or well label. Users can then change the label or delete the highlighted portion. For contours, portions of the contour can be redigitized. SET MAP TYPE – Plan 2015 can analyze isopach, pore volume, hydrocarbon pore volume, top structure, and bottom structure maps. Structure amps are analyzed for area calculations only. Map scales can be set from the keyboard or by digitizing two points on the map. A Digitizing Tablet is an electrical-magnetic board and pointer (pen or cursor) that can send highly accurate XY points to a computer program. The board is about an inch thick, contains an electrical grid underneath a hard Formica surface. 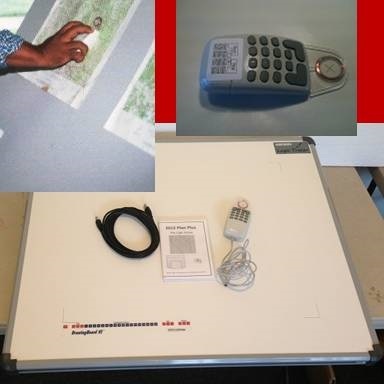 The digitizer's pen or cursor (mouse-like device with magnifying glass and crosshair) creates a magnetic field which is "sensed" by the electrical grid in the board. Press the tip of the pen or push a button on the cursor and a highly accurate XY point, representing this location, is sent to the computer through a USB connection. The standard accuracy of a digitizing tablet is .01" (10/1000). Divide an inch into 100 parts, the result is .01" accuracy. Larger digitizing tablets are also available in .005" (5/1000) accuracy, the higher accurcy adds $500 to the cost of the digitizer. The largest digitizing tablet has an active area of 44x60", other sizes are 36x48", 30x26", 24x36", 20x24", 12x18", and 12x12". Digitizer Stand - a pedestal under the digitizer with adjustable height and angle, $500. Some clients prefer to use a table or desk, mount on wall, or build a stand. Used electrical, dakota, and chaparral stands are also available. LED Light Panel - A thin LED light panel that lays on top of the digitizing tablet that turns the digitizer into a surface lit digitizer. Fairly expensize but useful for digitizing mylars, x-rays or other materials better seen with a back lighting. The Plan Plus and Plan Digitizing System includes the Plan Plus or Plan software and a GTCO Calcomp Logic Tracer or GTCO Rollup digitizing tablet. The software will also work with the GTCO Calcomp Drawingboard, GTCO Super L, Numonics Accugrid, and Summagraphics digitizers. The digitizer can "sense" almost an inch above the surface allowing the digitizing designs on top of paper, cardboard, plastic, or plywood. 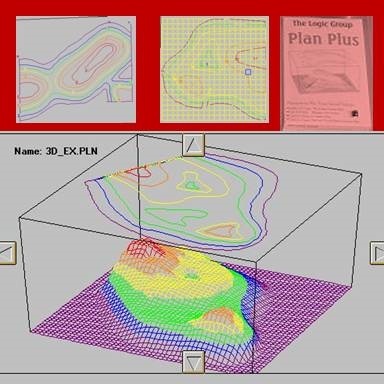 Besides the basic features of Plan, Plan Plus adds several advanced features which enhance the analysis of contour maps. Features available in Plan Plus include: viewing contour maps in three-dimensions, computing drainage radii, analyzing volumes from structure maps, discretizing values from contours, analyzing complex maps of multiple hills and valleys, and printing or plotting maps in various scales. Viewing a map in three dimensions allows the user to visualize the characteristics of the reservoir. Plan Plus provides a rotation of the image so that the structure can be viewed from various angles. Well locations can be included on these displays. Plan Plus provides a volumetric estimate of drainage radii dependent upon user input production and drainage shape. Drainage shape can be circular, square, elliptical, or rectangular. For ellipses, users specify the width to height ratio and the degree of tilt. Using this portion of Plan Plus, production can also be estimated from drainage shape and an input radius. Often, contour values taken at discrete intervals are needed as input into simulators or other programs. In Plan Plus, users can define regular or irregular rectangular grids and place these over the displayed map. Values are then extrapolated at each grid value and saved in matrix form in an ASCII file. Plan Plus computes map volume by both the Trapezoid method and Vertical Slice Method. Comparing results from these two methods aids users in checking that maps have been correctly defined. Plan Plus also includes extra algorithms on the Pyramid and Combination Methods to provide accurate results from maps with many hills and valleys. Plan Plus allows users to print and plot many useful figures and graphs. Maps can be printed with user defined scales or be saved on the Windows Clipboard for easy importing into other programs. 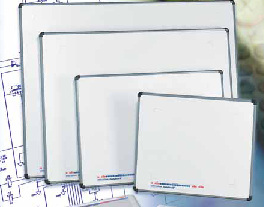 Files can be saved in TLG format or as DXF files for use with programs such as AutoCAD™. A Windows 95 version of Plan Plus is available and designed specifically to take advantage of Windows 95's 32-bit processing. Plan Plus has been designed to offer map analysts a useful tool. On-line instructions and documentation provide help on using the program. Let Plan Plus help you analyze maps quickly and accurately. Add $500 for a digitizer stand. Add $100 for an extra pen stylus or cursor. Add €370 for a digitizer stand. Add €75 for an extra pen stylus or cursor. Add $530 for a digitizer stand. Add $110 for an extra pen stylus or cursor. Add £305 for a digitizer stand. Add £60 for an extra pen stylus or cursor. Add $550 for a digitizer stand. Add $110 for an extra pen stylus or cursor. For our USA potential clients we have several Logic Trace Demo Units available with a 20x24" digitizing tablet and a copy of the Logic Trace software. With the demo unit the user can try all features of the tracing system and see if the system meets their needs. The demo units are free to try but require shipping prepayment and can only be kept for one week. Call our office for more information or to order one. Shipping a demo unit is too high for our overseas clients. For our overseas clients (and for our USA clients) we do offer a 30 day money back guaranty. Upgrade to the 2015 version of the software get an additional license of the software for half price. Save money buying a Plan or Plan Plus Digitizing System with a refurbished/used digitizing tablet (sizes 36x48 and 24x36 only". Load a map, set the scale, and trace a cotour automatically following exactly the path of the contour in the image map.Greatly improves digitizing accuracy, improving area and volume accuracies. As you digitize on screen the contour follows the contou in the on screen map. With the 2015 update, the software supports jpg, pdf, png, and pdf file formats. Have well data but no conntour map? Digitize your well locations with formation thicknesses and hand draw on screen or with the digitizing tablet the contours and compute map volumes.